Because I criticise Islamic jihad and Islamic sharia, a common accusation from horrible white Western leftists is that I am "racist". Now it is almost impossible for a white person to prove they are not racist. It is like being accused of being a witch. So instead of trying a normal route, I thought I would put up a page that might make people think, if they have an open mind. Consider the response of ex-Muslims to my writings. I said in my L&H speech on Islam that it is good for us critics of Islam to listen in particular to ex-Muslims. Ex-Muslims have loved ones who are still Muslim, so they do not hate all Muslims. They just want personal liberation from a religion. That is the type of criticism of Islam all critics should aim for. 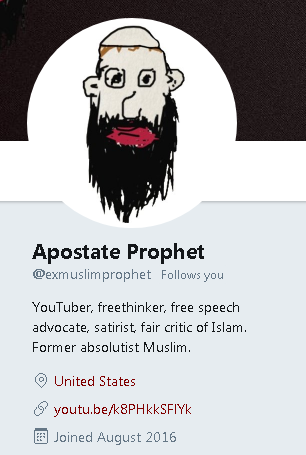 I am in fact followed on social media by quite a few ex-Muslims, secular and liberal Muslims, and members of minorities living in the Islamic world. 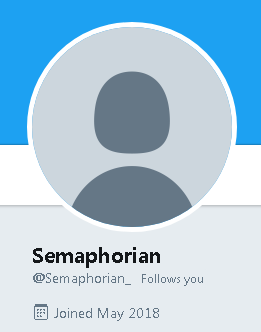 I think this means I must be doing criticism of Islam right. 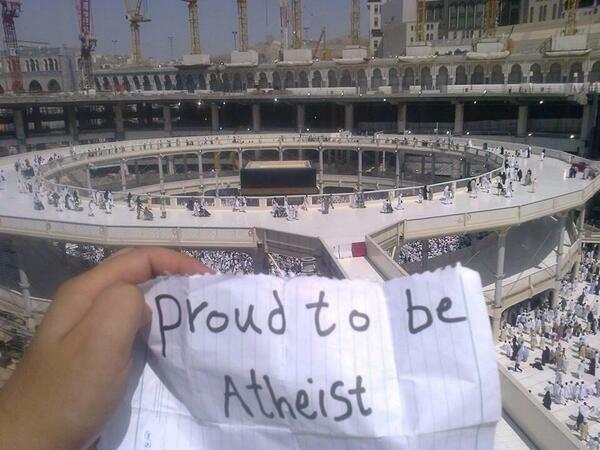 An oppressed Saudi atheist holds a sign at the cube in Mecca. There is a universe of ex-Muslims, and secular/liberal Muslims, mostly underground. These people still exist. They are underground or in exile. But their day will come again. 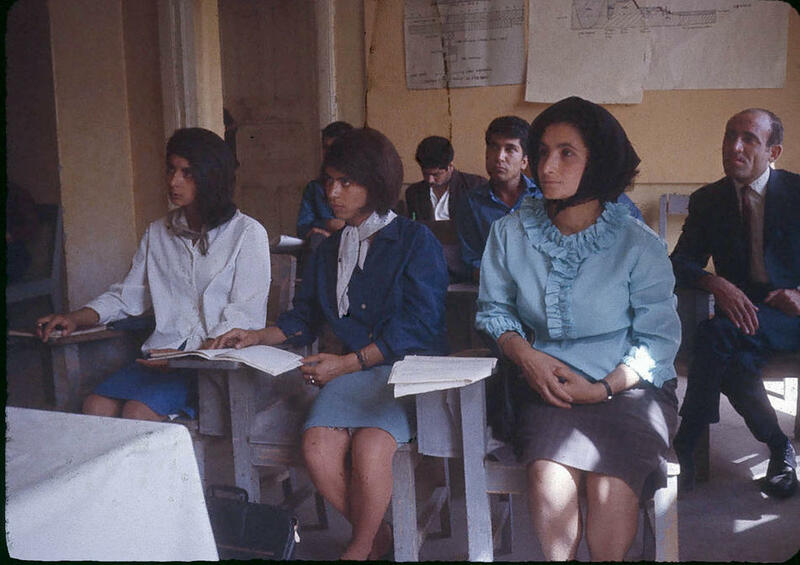 Radical Islamist oppression is not "their culture". It is a modern revolution, and it must be stopped. 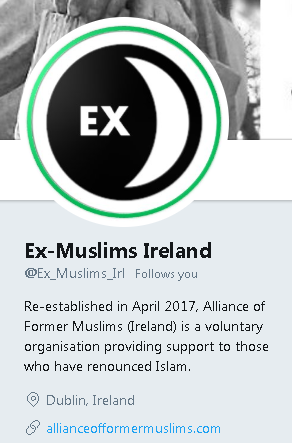 Here are some ex-Muslims that follow me on Twitter. To white western leftists who accuse me of "racism", like this guy and this guy, the existence of these ex-Muslims is incomprehensible. 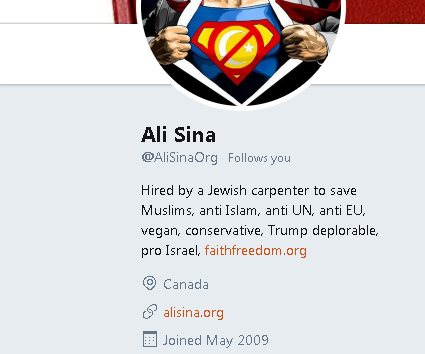 Noted ex-Muslim Ali Sina, author of Understanding Muhammad, follows me. 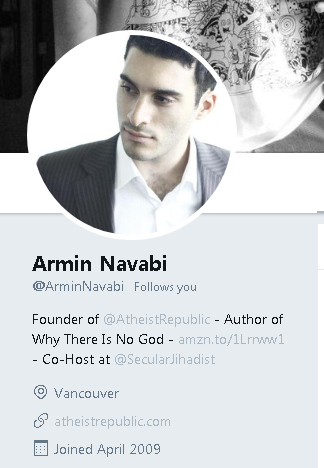 Noted ex-Muslim Armin Navabi follows me. 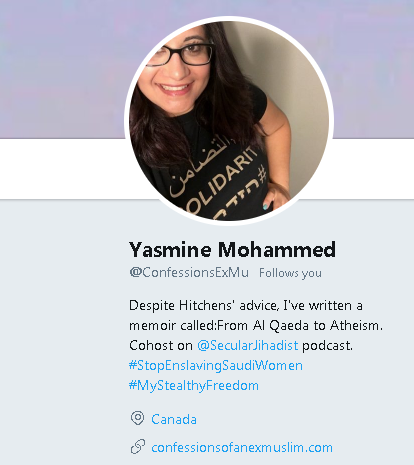 Ex-Muslim Yasmine Mohammed, author of Confessions of an ExMuslim, follows me. 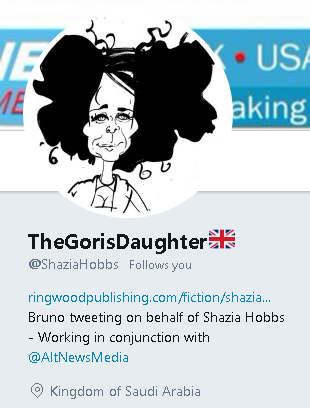 Ex-Muslim Shazia Hobbs, author of The Gori's Daughter, follows me. 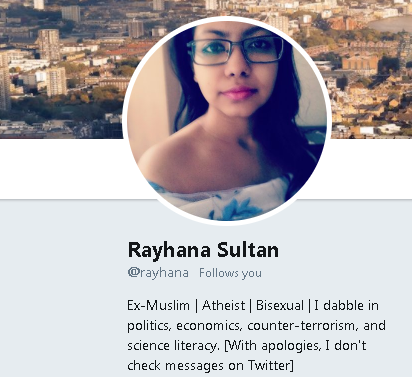 Ex-Muslim Rayhana Sultan follows me. 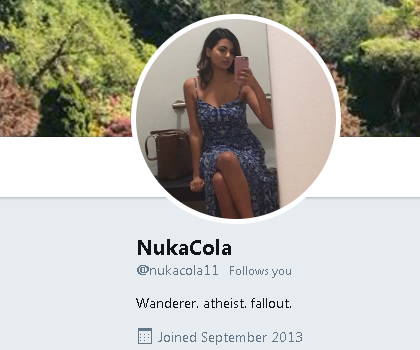 Ex-Muslim "Nuka Cola" follows me. 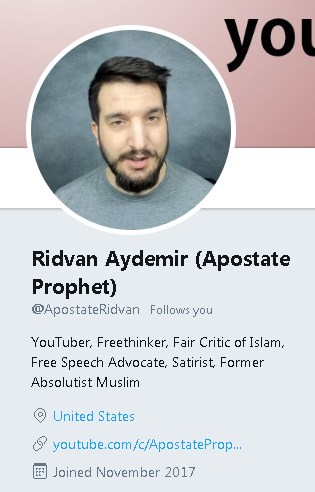 Ex-Muslim "Apostate Prophet" (see YouTube) follows me. Twitter suspended "Apostate Prophet" for no known reason. 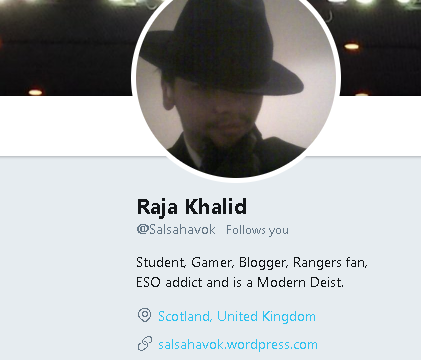 Ex-Muslim Raja Khalid follows me. 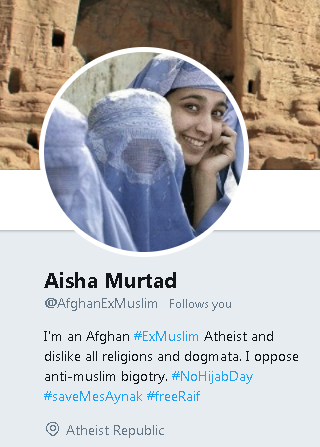 Ex-Muslim "Aisha Murtad" follows me. 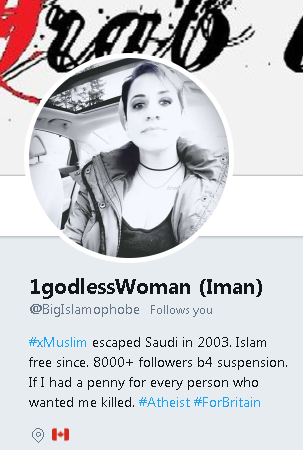 Ex-Muslim "OneGodlessWoman" (formerly here) follows me. 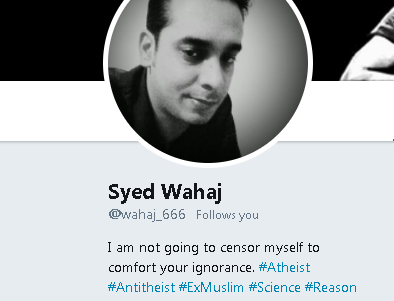 Ex-Muslim Syed Wahaj follows me. 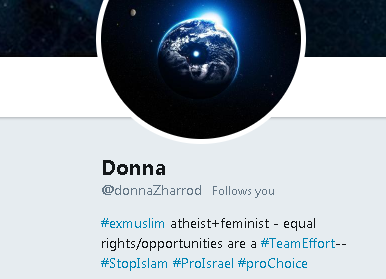 Ex-Muslim Donna Zharrod follows me. 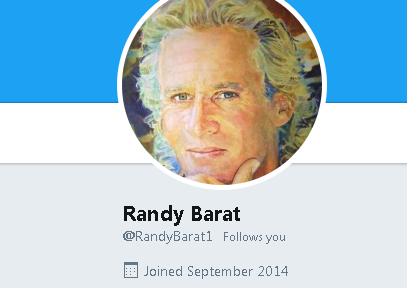 Ex-Muslim Randy Barat follows me. 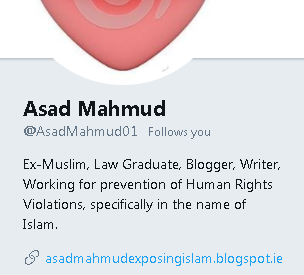 Ex-Muslim Asad Mahmud follows me. 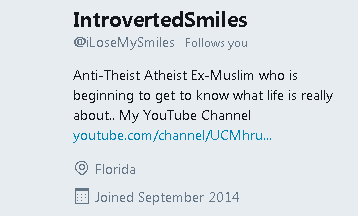 Indian ex-Muslim "IntrovertedSmiles" follows me. 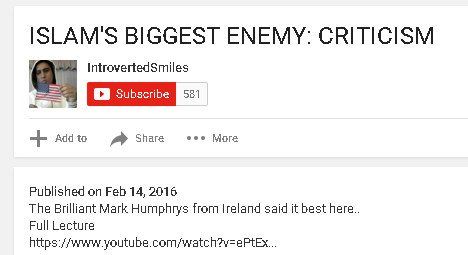 "IntrovertedSmiles" promotes my L&H speech on Islam: "The Brilliant Mark Humphrys from Ireland said it best". Formerly here. But he later deleted his channel. However, later, he came back. 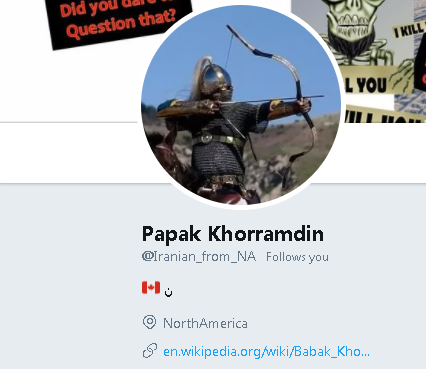 Iranian ex-Muslim "Papak Khorramdin" follows me. 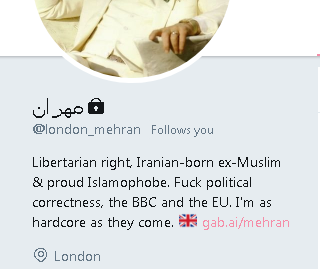 His account is named after a 9th century Persian who rebelled against the Islamic Caliphate. "Papak Khorramdin" promotes my page about Killings for Islam. My criticism of the high-profile Irish Muslim Brotherhood prisoner Ibrahim Halawa and his Muslim Brotherhood father Hussein Halawa has led to years of abuse from Irish leftists. They have endlessly called me "racist" for not supporting the radical Halawas. So it is interesting that Egyptian Christians and Egyptian liberals do not see it that way. To white western leftists who accuse me of "racism", like this guy and this guy, the existence of these Egyptians is incomprehensible. 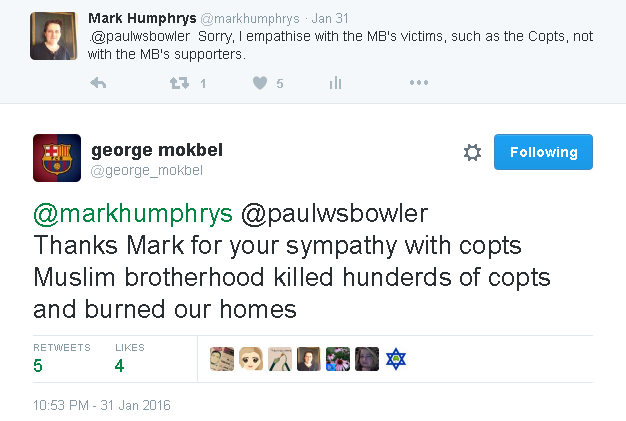 Egyptian Copt George Mokbel thanks me for standing up for the Copts against the Muslim Brotherhood. Another Egyptian Copt, An_Egyptian, follows me, and likes my Halawa stuff. Another Egyptian hates the MB and likes my Halawa page. He does not seem to understand this guy's insight that I am only anti-Halawa cos he is brown. Another Egyptian promotes my site. She really hates the MB. She uses much stronger language than I do. If only this guy could explain to her that she only dislikes the MB cos they are brown. A liberal Egyptian tries to promote my site to Irish leftist Halawa supporter "Olive Bridget". She will not listen. She blocked me for criticising Halawa, and was so angry she complained to my employer. Liberal, secular Egyptians should expect no solidarity from the Irish left. They are the "wrong" type of Egyptians. An Egyptian likes my page on the Clonskeagh mosque. This Egyptian promotes my page, unaware that only racism can explain my dislike of the Muslim Brotherhood. He hates the Muslim Brotherhood - as do millions of Egyptians. If only left-wing planks Brian Lucey and Donal O'Keeffe could explain to them that it is because they are racists. 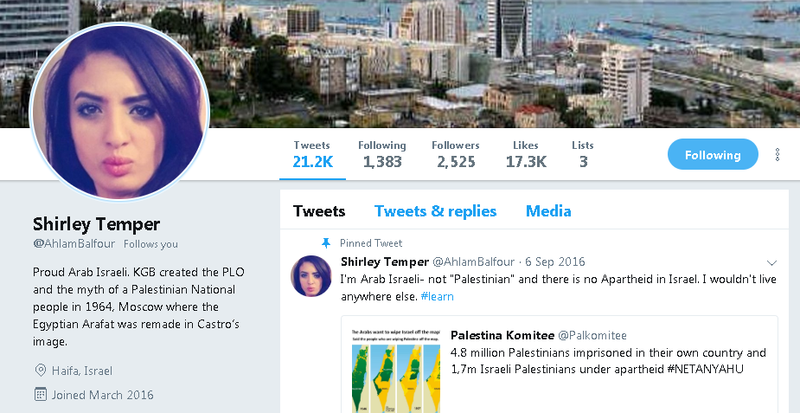 Israeli Arab "AhlamBalfour" follows me. 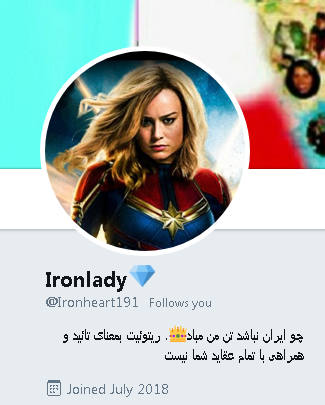 Iranian liberal "Ironlady" follows me. 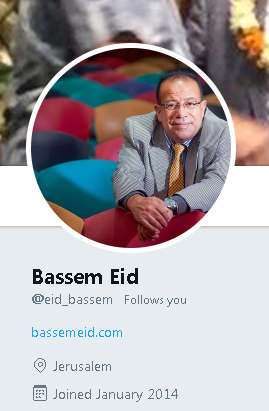 Noted Palestinian activist against PA abuses Bassem Eid follows me. 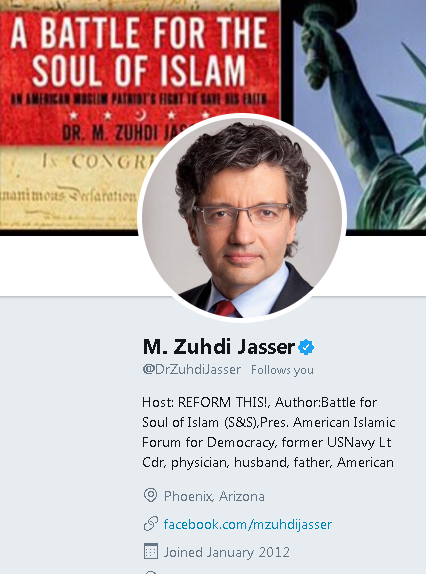 Noted Muslim reformer M. Zuhdi Jasser follows me. Narrated by the liberal, anti-jihad Muslim, M. Zuhdi Jasser. 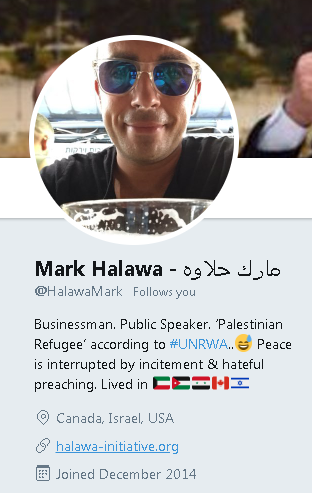 The "good" Halawa, Mark Halawa, follows me. He was born into a Kuwaiti secular Muslim family of mixed Muslim and Jewish background. His father was a Palestinian Muslim. His maternal grandfather was a Jordanian Muslim. His maternal grandmother was a Jew from Jerusalem. He became pro-Israel and converted to Judaism like his grandmother. Not to be confused with the Muslim Brotherhood Halawas, the Irish Halawas!